This month marks seven years that Mimi has been barefoot. Yep, we were part of the barefoot thing before the barefoot craze really hit. Long story short, she had really crappy feet, with a history of lameness and a near-miss with laminitis. I figured I didn’t have much to lose, besides my sanity. And even that was already questionable. Despite the expansion of my vocabulary (hoof boots…they bring out the colorful in all of us), it’s a move I have not regretted. My only regret is not doing a better job of tracking the changes in her hooves over the years. I look back at early ride pictures, and before that, to our show ring days, and cringe at the bean cans that appear to be strapped to my pony’s legs. It’s hard to believe they’re the same hooves. So yesterday, I actually managed to get pictures. I’ve spent a lot of time working on my trimming skills, and less on my photo skills. It’s really hard to juggle a camera, a hoof, and a fidgety pony, all in crappy barn lighting. So the photos aren’t the best quality. But at least I finally have photos, and it’s my goal to take pictures of her feet, starting now, on a monthly basis. Despite not riding much this summer, I’ve been diligent about trimming her feet. She gets trimmed about every 2-3 weeks. She’s in turnout about 12 hours a day in a three-acre pasture (by “pasture” I mean mostly dirt lot with the barest whiff of grass growing…11 horses in one space does a number on growing things) with an attached sand arena. Those 11 horses keep each other moving all day/night long. So she still gets a lot of walking exercise, which contributes to continued hoof growth. However, the ground isn’t abrasive enough where she’s at to really do much for self-trimming. It keeps her walls under control, but there’s not much loose sandy stuff to get in and scrub out her soles/bars, or keep her toes/heels in check. Which is where I come in. In typical pony fashion, she grows a lot of heel. I’m constantly having to nip off 1/4″ or so of heel with every trim. She grows a moderate amount of toe, but nothing that can’t be taken care of with a pass of the nippers. So now, I give you photos, with attached commentary along the way. Again…this is just what I do and what seems to be working for me. I’m not an expert, and always have something to learn, so gratefully accept any input someone might have. It’s an ever-changing field with endless possibilities for knowledge expansion. Which is part of the fun. Front hooves. Should have taken the “after” photos from the side side. Her RF is pretty good. Her LF is her “bad” hoof. When I trim, I start at the RF and move around her in a circle, finishing with the LF. Consequently, I’m tired by the time I get to that last hoof, and it doesn’t get as much attention paid to it. Compounding matters is the fact I am right-handed, and have a hard time rasping the inside of the RF. As a result, her heels have become imbalanced on that hoof. So this time, I started with that RF hoof and put my energy into fixing it. Result: harder to tell from the angle I took the “after” shot, but it looks much better. Another trim should have those heels balanced again. It was bad enough I wasn’t comfortable taking off that much heel in one go to rebalance it then and there. I finally got all the flare from her front hooves under control…the toes are finally short enough and she’s not growing out any funky growth/stress rings at the moment. Hings. Toes are pretty good. Heels are a little high. The scooped-out quarter on her LH is through no deliberate act of mine…she blew out that chunk of wall several weeks ago, and I’ve just done my best to smooth that section. Right Front. Has some excess wall around the toe. Heels are high. After: White line is actually tighter in person than it looks here. It’ll never be 100%, due to the stall environment she lives in…she can’t help but trod through urine on a regular basis. The joys of boarding…it’s something I have no control over at this point. There are always sacrifices and trade-offs to be made…I put up with a lot because of the fabulous turnout. Space and that amount of turnout time are at a premium and hard to find. I hate her bars. It’s pretty much a non-stop challenge for me to keep her bars under control. They grow fast and prolific, so it’s a constant battle to keep them from laying over and getting “stuff” under them. Also, her feet are small enough that everything is sort of crammed in there…not much space to work around in there, so differentiating between bar and sole gets a bit interesting at times. Right Hind. Took off the excess wall and the heels. Her hind feet always look pretty good. I’m thrilled with her frogs…I can’t believe how much they’ve spread out. Right Hind. More of the same. Had some weird bar growth on the right side that I scraped away. Rasped that blow-out quarter so it was smooth. Right Front. The “bad” foot. You can see how much higher the inner heel is. 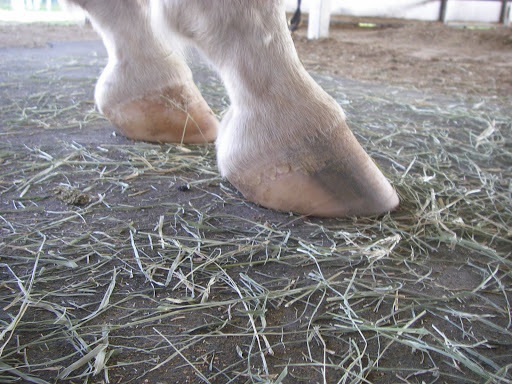 This was also the hoof she had an abscess in last year…exactly a year ago. It’s still growing out a little strange from where it blew out right at her coronet band on the outside heel. (Why can’t my horse be normal and blow out her abscess through her sole?) I don’t like how deep her frog clefts are on her front hooves, especially this one. I suspect there might be a bit of thrush at work, although she’s not sore/tender at all. Nevertheless, I squirted some pure tea tree oil down in there. Had to do some scraping away at the bars, especially on the right side. I managed to get the heels a little more even, but there’s still work to be done. I should have taken shots from the front as well to check for side flare…next time. I think it's awesome you've learned your pony's feet so well. In the last 6 months I've really only woken up to the balancing act of increased distance vs. the barefoot horse and I'm trying to learn as I go. Still not to the trimming it myself stage but I am starting to feel confident enough to rasp out the worst of a chip when it happens and have moved to booting the front two hooves in order to ensure she still has toes. Any advice on learning how to really just to the basic maintenance trim work for just my own horse? Hey Caitlin — You're starting at a good place. Getting comfortable enough to smooth out chips is a really good way to start…and so is a good rasp. :) I did all of my trimming with a rasp entirely for about a year before I felt comfortable enough to buy nippers and actually hack off a sizeable chunk of hoof at a time. There are some good resources out there online, and I got most of my knowledge just by talking to and getting a couple of trimming lessons from a very knowledgeable barefoot trimmer (Kirt Lander, who owns Renegade boots). If you've got a good barefoot trimmer, start by talking to them. Most of the good trimmers I know will encourage owners to do maintenance trims in between appointments, and once you express an interest, the good ones should be happy to share some techniques with you. I started out just by doing maintenance rasping, and moving trimming appointments further and further apart. I got feedback from Kirt whenever I'd go to rides he would be at, and he'd give me “do this, not this” tips. Rasp little, and frequently. For a while, I was rasping once a week, because if you can stay on top of a good trim a barefoot trimmer has already put on them, it gives you a really good guideline to work with, and it's harder to go off base. Take pictures, too, especially right after the trimmer is done…it'll give you something to compare to.